For more fun and healthier daily use of toothpaste. Choose a toothpaste you like! Pleasia is a naturalism dental care brand that respects different preferences with various natural ingredients to offer necessary effects for your dental status as well as soft after-use feel. It doesn't contain fluorine to make it safe for all family members. Yuzu Salt Gum Care is a toothpaste for general oral care such as cavity prevention, plaque removal and gingivitis prevention. The optimal blend of Yuzu sweetness and saltiness gives fresh pleasure. Pleasia toothpastes do not contain 8 ingredients including sulfate surfactant, methylparaben and tar color. 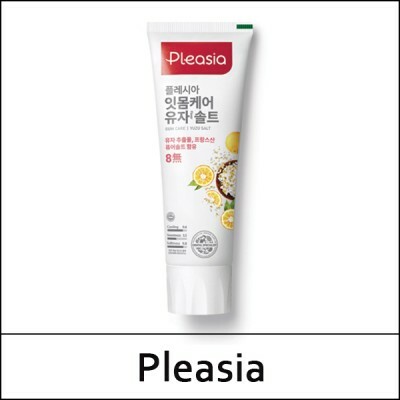 In addition, Pleasia products have all ingredients specified and displayed to provide detailed information so that consumers can feel safe to use. With the application of Taste Keeping System™, you can still enjoy the true taste of food when you eat even right after brushing your teeth.